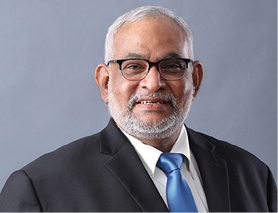 August 31, 2018 (LBO) – Former CEO of Commercial Bank (COMB) Jegan Durairatnam has been appointed to the Board of Directors of DFCC. He joins the board as an independent non-executive Director. Duriaratnam spent 36 years at Commercial Bank rising to the level of CEO. Commercial Bank is the largest private sector bank in Sri Lanka. DFCC is the largest shareholder of COMB with a 13.5% holding. The Chairman of DFCC Royle Jansz is set to retire in 2019 after 9 years as a Director. There is speculation that Durairatnam is the leading candidate to replace him. The government through state entities controls approximately 33% of the shares of DFCC. Another former COMB CEO Ravi Dias was appointed as the Chairman of Seylan Bank in 2016, approximately one year after joining the Board of Directors. The banking game of musical chairs is also evident with Dinesh Weerakkody being appointed as Chairman of HNB after being Chairman of COMB, and previously a Director of DFCC.